Who will create the most beautiful garden? 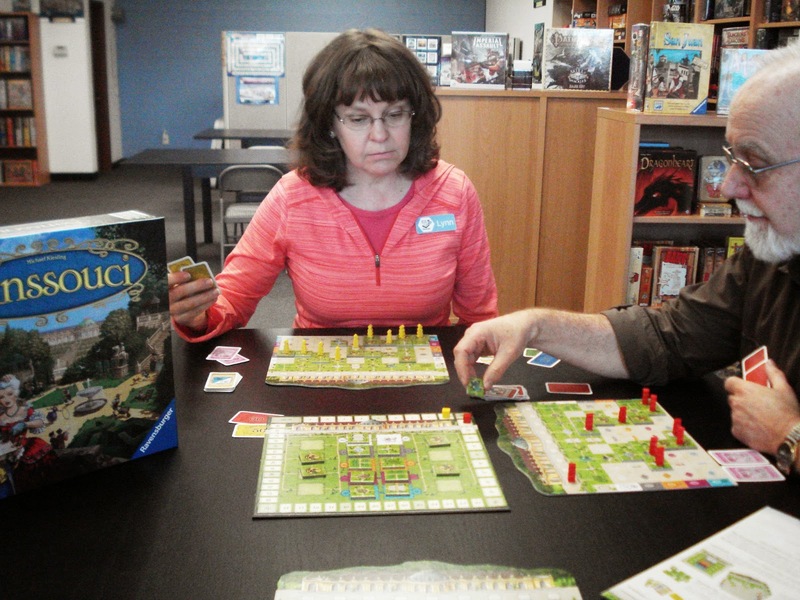 Sanssouci is a game about creating a garden full of pathways and moving your 9 nobles as deep into the garden as possible. The game begins with each player selecting a player garden board from the 4 double-sided garden boards. Each garden board is made up of 9 columns of garden features each headed by a noble, and 6 different colored rows. Each board will have a slightly different layout. End of game is triggered when every player has used all 18 cards in their player deck. In each round points ranging from 1 to 6 are awarded for moving one noble down a garden path. The farther down a noble goes the more points are scored. Additional end of game points are earned for completely filing in a row and/or column with garden tiles. Each player will have 2 secret objectives that will score additional end of game points if achieved. The player with the most points wins. By the way, getting your nobles all the way down to the bottom, 6th row is not as easy as it looks. Each player’s deck consists of 18 cards, one for each of the 9 garden features, 8 color row combinations, and one wild card. On each turn a player will have 2 cards in their hand drawn from their face-down deck. They will choose 1 of these 2 cards to play from which they will collect a tile from the 10 available garden tiles on the central supply board. The card played will determine the type of garden tile and from where on the supply board a tile may be taken. Each tile depicts a garden feature. The selected tile must be placed on the player’s board in the same column that matches the garden feature of the tile and in the same color row as it was taken from the supply board. The turn is concluded by drawing back up to 2 cards and refilling the vacant spot on the supply board with a new garden tile. Play continues until players have worked their way through all 18 cards of their deck. The crux of the game is to think ahead in laying your pathways to get your nobles down the 6 rows as far as possible. Remember, there is only one card for each garden feature. So, a noble may and most likely will move into another column(s) in order to get down to the lower rows – he must however, end in the same column as he started. The basic rules include a little twist. There is a way to make a selected tile a wild tile that can be placed anywhere in a particular row and column. This wild tile must be placed face down on the player’s garden board as "gardeners". While these gardener tiles really help in filling in the garden and creating pathways, nobles cannot stop on them, they can only be used as a pass through. If not thoughtfully placed, these tiles can restrict noble movement and the level of points scored. Sanssouci is a relatively light strategy game, but more thought provoking than you would expect. Additionally, the game includes some expansion boards that overlay a portion of the player boards adding another bit of strategy. 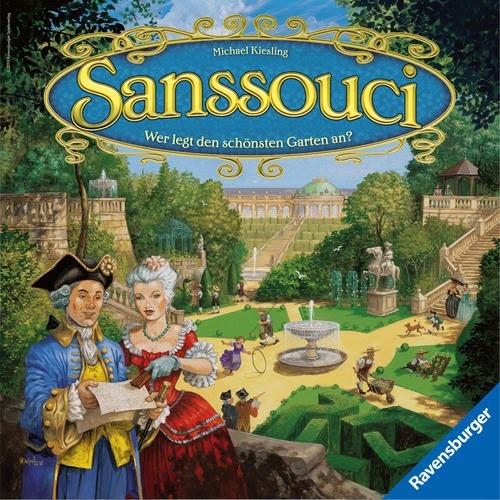 We have an open copy of Sanssouci available in our Demo Games Library for you come in and try.